Kate recently asked me how I heat water in my van, so this quick little post is to answer that. Spoken like a true fellow-tea-fanatic, she said "If I can have my black tea in the morning I can live anywhere." 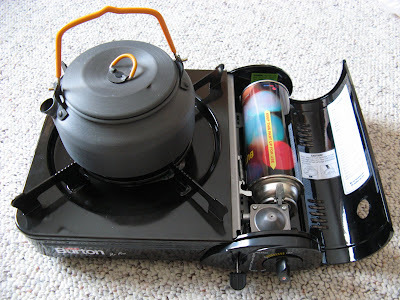 In my van, I use a lightweight GSI 1-quart teapot and a Max Burton butane stove for heating water for tea or oatmeal, cooking soup, and similar simple stuff. The Stove: There are all sorts of portable butane stoves out there, and this is the one I just happened to pick. I just LOVE this one, although I'm sure they all work about the same. It is surprisingly lightweight and portable, and it came with a nice hard plastic case measuring 13" wide, 11.5" tall, and 4.25" thick. 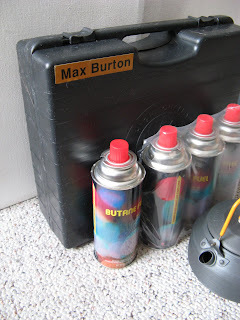 For fuel, the stove requires the use of generic disposable butane canisters (7.8 oz each), which can be ordered online or bought at local hardware and camping stores. You just make sure the ignition knob is turned to "Off," pop in your butane canister (notched-out section up), push down a lever to lock it in place, and then turn the dial (piezo-electric ignition). 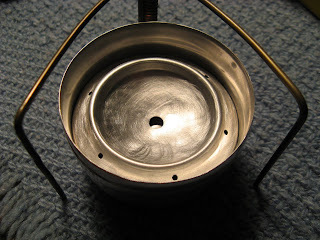 It lights just like a normal stove and it is extremely easy to use. Lets see... it comes apart easy (simple to clean), is very sturdy (made of metal & porcelain-enamel coated steel), and a butane canister really lasts for quite a while. 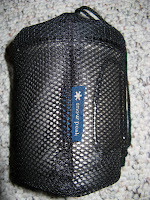 Even if you aren't a traveler or vehicle dweller, I recommend having one of these in your home in case of emergencies. 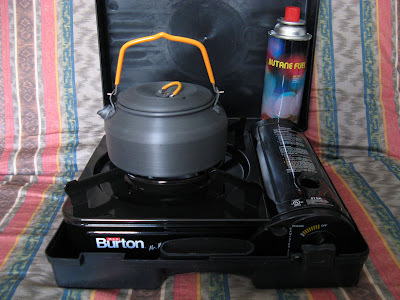 I have read online in several places that portable butane stoves are safe to use in a vehicle, BUT I don't totally believe that and want to emphasize caution. I don't use the stove in a totally enclosed space without having windows open and some air flow, because "when oxygen is limited, burning butane can form carbon monoxide." (I stole that line from Wikipedia). Carbon Monoxide is a colorless, odorless gas which is extremely poisonous. 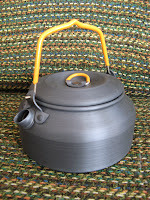 The Tea-Kettle: I chose this teapot because I originally really wanted a lightweight one for backpacking, and I saw it on Two-Knives-Katie's site. She said she loved hers, and I can now agree - It is a totally cool little kettle. It's extremely lightweight (1/3 pound), since it is made of Halulite, and holds just the right amount of water (32 oz). The lid doesn't stay on the tightest (doesn't really matter I guess), and I do wish the handles weren't coated since I think they could eventually melt... but otherwise I think this is an excellent little teapot. If I didn't already have this one, though, I might try the Brunton aluminum kettle . It has excellent ratings which say that the lid fits tight, and it looks to me like the handles aren't coated with a meltable material. My kettle works GREAT though, and water boils extremely fast inside it! That is all that really matters. Totally apart from that set-up, I do have a backup stove that is mainly for backpacking. Using some online instructions, I've got a home-made little Heineken-can Penny Stove that burns denatured alcohol (easy to get anywhere). I'm not kidding when I say TINY and perfect for backpacking. I could use this in my van, too, if I were out of butane and unable to find any. For now I just keep my little penny-stove inside my bugout bag. That is a really nice set up. Simple, effective and minimal. I must also note it looks very CLEAN! All in all it looks perfect for your lifestyle. Thanks for all the info! I appreciate the time you took and the explanations! Now I know just what to do. Todd - thanks, yeah, definitely clean.. That is one reason I keep a bottle of that Awesome-brand spray cleaner in my van. Doing housekeeping as my money-making job lately has obviously leached into my day-to-day life. lol. cw - neat, so your 12 volt coffee maker works good? kate - glad it helped! Jane - that is so cool :) How often do you use yours? It is definitely the best stove ever. I would avoid the aluminum kettle unless you are walking or cycling with it. Aluminum is just not nice to cook with. Provided you keep water in your kettle, I don't think the coating on the handle is likely to melt, because it won't be able to get hotter than boiling point. Nomad - do you mean that it would only be good for walking/biking because of it's weight? yes, I could see that cooking in aluminum might not be so good, although I just use my kettle for water-only. I've got a regular pot/pan for soup & cooking eggs, things of that sort. And about the handles melting, I am actually concerned with that more for backpacking, when suspending it above a campfire. Guess I wasn't very specific.. thanks for the comment! Redbeard - That is awesome! I have to try that. WOW! lovely like this post.What a great review. its really amazing .Thanks for sharing this!